Next Week MODEX 2018 in Atlanta, Georgia, beyond all the fun and interesting new technologies demonstrated, there is a critical conversation happening at the Topper Industrial educational seminar (http://bit.ly/2ib2n1V). Rarely is there a conversation about increased flexibility and process simplification. This is about to change. When companies (manufacturing or distribution) undertake lean programs, including Six Sigma, Theory of Constraints, or simply a consideration of value-added processes, the immediate thought is WASTE. While appropriate, the net result of eliminating wasteful processes is simplification and increased flexibility. Work simplification is one response to employees overwhelmed by increasing organizational complexity, information overload, and a 24/7 work environment. More than seven out of ten surveyed organizations rated the need to simplify work as an “important problem,” with more than 25 percent citing it as “very important.” Today, only ten percent of companies have a major work simplification program; 44 percent are working on one. Design thinking, work redesign, and technology replacement are becoming critical programs for business leaders seeking to simplify work practices, processes, and systems. Process simplification results in a simplified user interface, infrastructure, and application. 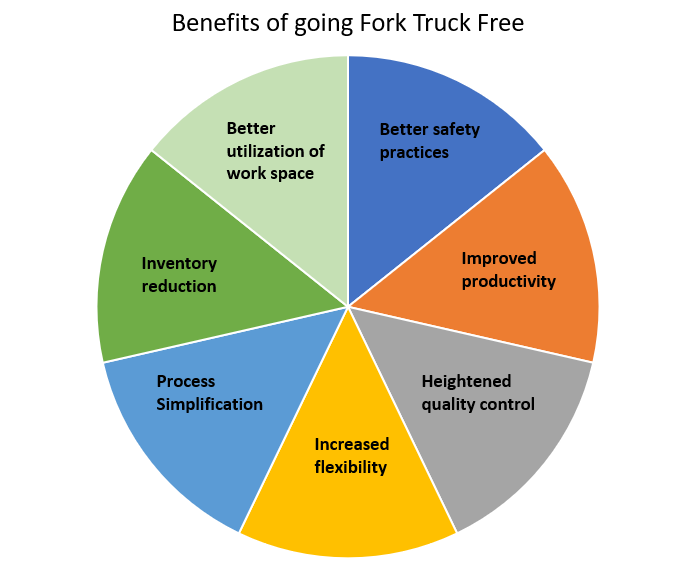 Fork Truck Free initiatives are a documented methodology to achieving ultimately simpler, more automated, more efficient manufacturing and material flow processes. Process simplification leaders must direct and improve the robustness of the end-to-end global manufacturing process of existing and new products from development to manufacturing, providing the key interface between R&D and the production floor. Best-practice manufacturing process involves incremental innovation with a major focus on global process development and simplification of transfer from the lead market to follow-on markets. The unexpected result from these simplified processes is increased flexibility. FTF utilization is shared as a deployment and maintenance of business process simplification, including engagement and alignment of cross-functional partners. Empowered as change agents, key influencers and technical leaders in development of manufacturing and supply chain strategy, focus on improving product/process quality and cost. The options now available by removing all the waste in a heavily populated fork truck zones capture innovative staging, kitting, material flow, and dynamic methods for moving materials more effectively. For more than twenty years, Topper Industrial, based just outside of Milwaukee, WI, has been a leader in the material handling equipment industry. The company’s product roster features industrial carts, conveyors, lifts, lifts & tilts, shipping racks, containers, casters, and cart components. From mother-daughter carts to quad steer carts to tilt carts and rotate carts, Topper’s material handling solutions make delivering material line side more effective through more efficient practices. Topper Industrial has a team of experienced professional experts able to assess and provide the right product for all material handling equipment requirements. Previous post Topper Industrial innovations highlighted in new video that shows large work platform that creates material handling solutions for the operator. Next post Improved Material Movement with Innovative Upgrade to Mother Daughter Cart Delivery Functionality by Topper Industrial. Topper Industrial Defines Fork Truck Free and Shares Examples of Cart Types Used in Cart Delivery.